When it comes to naming albums, Sorority Noise are either terrible at it, or geniuses with ironic statements. Forgettable is one of the most memorable albums of 2014 so far, and the new and upcoming band has made a large impression for their debut. Equal parts cathartic and sentimental, Forgettable treads the line between heart on sleeve and heart on the ground if you know what I'm saying. Sorority Noise play a style of music that falls into the quirky alt-rock genre that is becoming hazy with categorization. It's a blend of garage rock, with poppy hooks laden with sing-a-long choruses. Vocals are doubled with group lines aching to be screamed among with. The self deprecating "Mediocre At Best" is covered with angst and tongue-in-cheek self-hatred, and you can't help but smile and sing along, even with lines like "Nobody likes me. That's what I tell myself." Backboned by guitar chords that echo Pinkerton-era Weezer, the song stands out as a perfect representation of what Sorority Noise is. Pinkerton comparisons don't stop there. The main theme of a strong personal examination is also present, without ever becoming cheesy or sappy. The guitars and drums never try to outshine the lyrics, and act more as a thickening agent to the vocals, to create a very well mixed final product. Forgettable is emotional and raw, and at moments very tender and sentimental. The lyrics are honest and open, and while they get personal, it never feels forced for attention. Melodies reign supreme on Forgettable. Songs will work themselves into your head for days, as choruses and verse will replay as you hum along. The half-pace of "Blond Hair, Black Lungs," the honest verses of "Still Shrill," and even the simple bass line that opens the album ("Rory Shield") all stick out as glue-like ear-wormers. Forgettable builds and maintains a certain level of energy throughout but does go out on a bit of a whimper instead of a bang. While I always enjoy a quiet moment on albums, for a record as powerful as this, it seems like a waste to end with two slower songs. This is of course just a small complaint when the entire album is so great, and those two slower songs that close the album are still enjoyable. Various bands come to mind, and can be cited as influence for Sorority Noise; the short song structure of Joyce Manor, the quirky lyrics and guitars of The Front Bottoms, even the straight-forward rock of older Tigers Jaw. 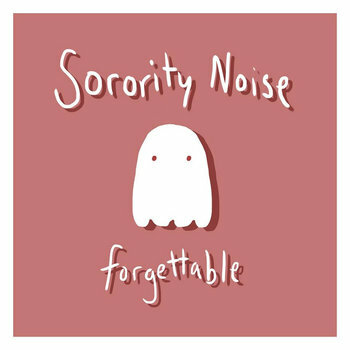 But the difference is that Sorority Noise does all of these better, and never feels like a cheap knock-off. They are their own contained unit and while influences are present, they never outshine what the band is trying to be. In their debut album, the band has created an amazing voice for themselves and that itself is truly rare these days.